“What a beautiful spot, lets buy the land and lay out a town!”This quote is attributed one of the Wiley cousins when they came upon the area that is now known as Wiley Park. In time their idea would eventually grow into a town that has a current population of 2700 people. Through the years there have been a great many people responsible for it’s growth, seeing it through hardships, and carrying on the everyday functions of this town. Galva’s early years and the people in them were the most important elements of what Galva was to become. Almost twenty years before the founding of Galva, the first settler arrived. His name was James Bonham. He was originally from Maryland, and decided to buy some land, and settle here. His house, built in approximately 1830, was located a couple miles northwest of where Galva would later be founded. He wanted to assure that the town would have a chance to thrive and when Augustana College considered relocating here he offered them ten acres of land, to that end. The college ended up locating in Rock Island, Il. Galva is located in a part of Illinois that was known as the Central Military Tract. The purpose of this land was to be given to soldiers who had served in the War of 1812. The land on which Galva is located was awarded to a man named Jacob Joy, who owned the land only one month, and without ever seeing it, he sold it . The first serious settlement in this area, however, didn’t really occur until about twenty years after James Bonham first purchased his land. In 1853 William Lorenzo Wiley, and his cousin James Martin Wiley, who were originally from Vermont, and on a land inspection trip from Brimfield, Illinois, to Davenport, Iowa. Before leaving on this trip they were notified about ten thousand acres of land that were available for sale about thirty miles northeast of Galesburg. The Wiley cousins came upon the area of which they had been notified, currently Wiley Park, and were so impressed with the land on which they were standing, and the area around it, that on that very spot one of them commented on the beauty of the land, and both agreed that they should buy the land, and attempt to settle here and found a community. The Wiley cousins also had a hand in bringing a railroad depot to Galva. In a conference with the Burlington & Quincy railroad officials, they were successful in convincing them to locate a depot here. It was after this conference that the Wiley cousins were assured to the success of their idea, and confident enough to buy most of the land on which Galva is now located. The village of Bishop Hill, which is located just west of Galva, was the most important element relating to Galva’s early growth and prosperity. Shortly before the founding of Galva the people of Bishop Hill had decided that they didn’t want a railroad coming through their community, it could have dramatically changed their solitary way of life.When the Wiley’s decided to locate a town along the railroad route, they decided that this, their second opportunity to be involved in a railroad, should not be passed up. In passing up the opportunity to have a railroad just a few years before, their best way of transporting products made in the colony, would be through the new town to the east. Through the colonists’ early efforts Galva became a successful town, and because of the Wiley’s gratitude to them, they were given the opportunity to name the town. Several suggestions were made, but the one suggestion that most people were in favor of was one made by Olof Johnson. He suggested that the town be named Gefle, pronounced Yaveley, after a seaport in Sweden from which many of Bishop Hill’s residents had sailed. From this suggestion the town was named Gefle, but only for a short time. It became evident that the name was hard to pronounce, for visitors, and residents alike, leading to a revision of the name. This revision tried to stay close to the general pronunciation of the name, but was much easier to remember, that name was Galva. For the commercial use the colony of Bishop Hill built the first permanent brick building. The building marked Glidden Brothers was built by the Bishop Hill colonists as a storage building, it is currently part of Hathaway’s True Value Hardware store. Out of this building they could load their products off of a wooden platform north of the building into trains to be shipped to wherever they were to be transported. This building was also used to store goods such as grain, pork, and brooms, all of which were made in the colony. At the same time as the commercial building was erected, the first house was also being built by these people. This house was to serve as a kind of motel, or boarding house for new arrivals from Sweden. They would stay there until they could build themselves a shelter. This house still stands today just south of Washington Park, although not in it’s original form, it now has a second story. In much of Galva’s early history the railroads which have run through here were credited with it’s initial growth, and in fact its existance. Galva was thought to have a great advantage over many towns because not only did it have two tracks going through town, they actually crossed here. The first rail line to locate a line here was the Burlington & Quincy railroad company, originally named the Central Military Tract Railroad Company.This group was formed in 1852, and ran a line from Aurora, Illinois, to Galesburg, Illinois. Another branch of the Burlington Route also came through here, it was called the Keithsburg branch, and as its name implies, the largest town along its route was probably Keithsburg, Illinois. Another later Railroad company to locate through Galva was the Peoria & Rock Island line. Depots for both of these lines were located here, and because the lines met here Galva was considered an important transfer site, and a roundhouse, which is a place where trains could switch tracks, was located here with several train engines stationed there. For Galva’s first three years there was no official form of government in place. It was most likely due to the fact that to that point Galva was small enough that it didn’t need anything more than an unofficial type of government. However by 1857 it had become evident that an official form of government was needed so that this growing community could prosper and grow. On May 11, 1857, thirty-two men, twenty-nine in support, and three against, voted in the town form of government. This form of government was not seen as enough and was later supplemented by the village form of government. On February 12, 1879, 354 people voted, 295 for the village form, and 59 against. The first president of the town board was a man named Wheeler B. Sweet, and he was president for one year. His replacement at the end of that year was C. A. Shurtleff, who served as president of the town board for the next nine years. In 1879 when the village form of government was voted in a new president for that group was elected. This man was B.S. Eldridge, and the first village clerk was W.F. Wiley. In large part Galva owes its success to the industries which have been located here. The first of these industries was a foundry and machine shop. It was founded by Thomas Guthrie, who came here from London, England. This company later advertised that they produced boilers, engines, broomcorn presses, scrapers, and that they also repaired products that were made of silver and brass. One of the most important industries in and around Galva in the late 19th century was coal mining. At that time approximately half of the coal produced in Henry county came from Galva. The largest of these coal-mining companies was Herdein Company which employed more than two hundred people at its peak. There were some smaller coal mining companies which were also employing people. Among these, smaller companies were names such as Union, Eagle, Atlas, and Murray. Many of the people employed in these mines were Swedish immigrants who worked in mines in the winter, and on area farms during the summer. An industry which proved to be even more important to Galva for a third of the way into this century was the production of pumps and planters. The company most responsible for this was the Hayes Pump and Planter Company. They, as their name implies, made pumps and planters, but they also produced cultivators, and harrows. 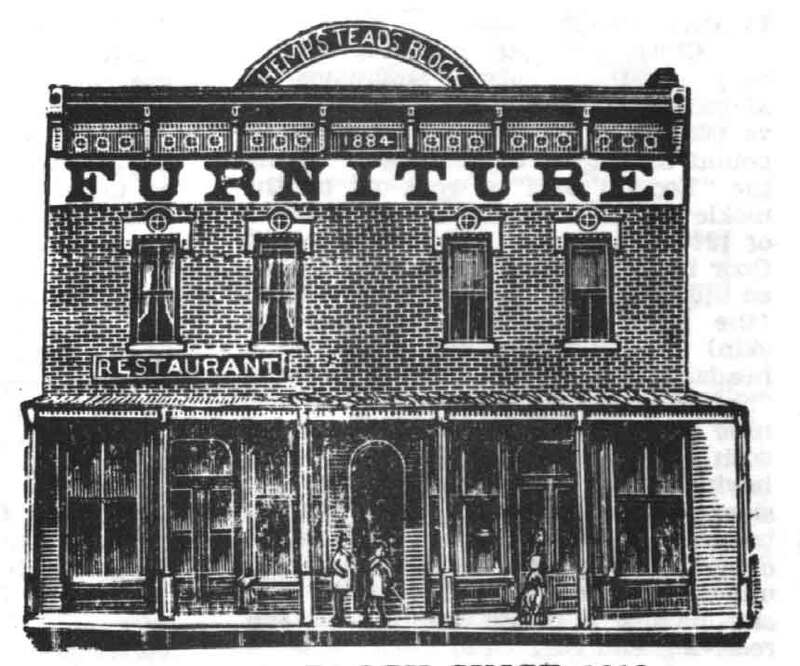 At one time this company was one of Galva’s largest, and employed two hundred fifty men, and they had over 3000 distributors and dealers in several parts of the United States. In 1889 another company, that made heaters and boilers, began operating. This company was the Mulford Heater Company. Their main product was a boiler which was known as the “Galva Boiler.” Their product line was fairly large, and included products such as pipe fittings, traps, and smoke pipes. Several years later the company changed its name to Galva Heater Company, and a publication at the time noted that those products were used in Hospitals and Schools throughout much of the country. One of the latest industries started during the late 19th century was the John H. Best & Sons Company. This company started producing robe and blanket racks in 1892, and is now one of the oldest existing industries still operating in Galva. Their current location was acquired in the 1920’s after a move from the south part of town. To Galva’s first residents education, and a sense of spiritual fulfillment were among the most important of priorities. The first church to be organized in Galva was the Methodist Episcopal Church, which would later be renamed the First United Methodist Church. It was organized on June 26, 1855 with 19 charter members present. For the first two years they met in a small schoolhouse near the center of town. In 1857 they began constructing a building which would ultimately cost them $3000. Because they began the building late in that year a load of lumber was brought to Galva from Rock Island as fast as it could be brought here. That winter the members of the Methodist Church met in an unfinished basement, the foundation of what would later be their first church building. Their second building would be built at the site of the current church, and receive several remodelings, and facelifts before being rebuilt into the current structure. The second church to organize in Galva was the First Baptist Church. It followed the organization of the Methodist church by only two days. It was organized on June 28, 1855, and there is no official record of the members present at that meeting, although it is thought that James, and William Wiley were present. The first building was located slightly south of the present building, and no year is provided for the construction of this building. The first building became too small to serve the purposes for which the congregation felt necessary, and the current building was built in 1866, and still stands today, with several modifications. The third and final church to be founded in 1855 was the First Congregational Church. It was founded on September 15, 1855 with 12 charter members present. After two years of sharing the school building with the Methodist, and Baptist churches they erected their own building in 1857. They were to stay in this building ten years, and build their second, current building in 1867. 1932 Galva High School Building as it appeared shortly after it was built. These people who were very religious, also felt that their children need a good education. The first school building in town was built just a few months after Galva was founded, near the center of town. Funding for this first building was provided by the Wiley cousins, as was the teachers’ salaries which averaged $138 a year. This first building was soon joined by a building on the site of the former F.U. White Elementary School. After serving for almost forty years, these buildings were replaced in 1894 by the first school building of brick construction. This building was built on the site of the second school, and for most of its existence was referred to as the North School. In 1948 it was renamed in honor of F.U. White, a man who had served as superintendent of the Galva schools for forty years. Before this building was built, it was decided that Galva schools should offer a high school course. Beginning in the early 1870’s it was housed in an addition to the wooden North School, and it was housed there until, the old F.U. White school was built. In 1932 the high school made yet another move, but this time into it’s own building. This building has served as the high school, then a junior-senior high school, middle school, and and currently as an elementary school. The most important element of education is learning how to read, and a man who ran a hardware business, and several other generous people in town saw that everyone had the chance to read. The first library in Galva was located in a store owned by a man named Charles E. Davis. For several years this temporary library served the citizens of Galva well, but by 1894 the Galva News commented that Galva was about the only town of it’s size in the state that didn’t have a public library. About fifteen years later, in 1908, Andrew Carnegie, who is well known for donating money to build libraries, gave a sum of $8000 to the city to be used for the construction of a library. This money was given under the condition that the city provide at least $800 a year for the maintenance, and general funding of this library. The building that currently houses the local I.O.O.F. Togetherness through groups which meet at intervals has always been an important part of life in Galva. One of the earliest, and longest lasting of these groups was the Galva Women’s Relief Corps. This was a group of women who organized to pay respect, through decoration, and monuments, the sacrifices of Galva’s residents during the Civil War. Another, later organization was the Women’s Club of Galva, originally named the Tuesday Club, which organized to promote culture in Galva, and to insure the well being of the people in Galva. Another organization, which organized in 1922, was the Parent Teacher Association. Like many other communities which had this type of organization, the purpose was for the parents, and the teachers to get to know each other. It is noted that this group held a meeting every summer for students just entering school so that the kids could get to know each other before they went to school with each other.